I found The Walking Dead: No Man’s Land an easy sell. Turn based combat, base building, character development, and a cool IP in a great mobile game package. Sign me up! 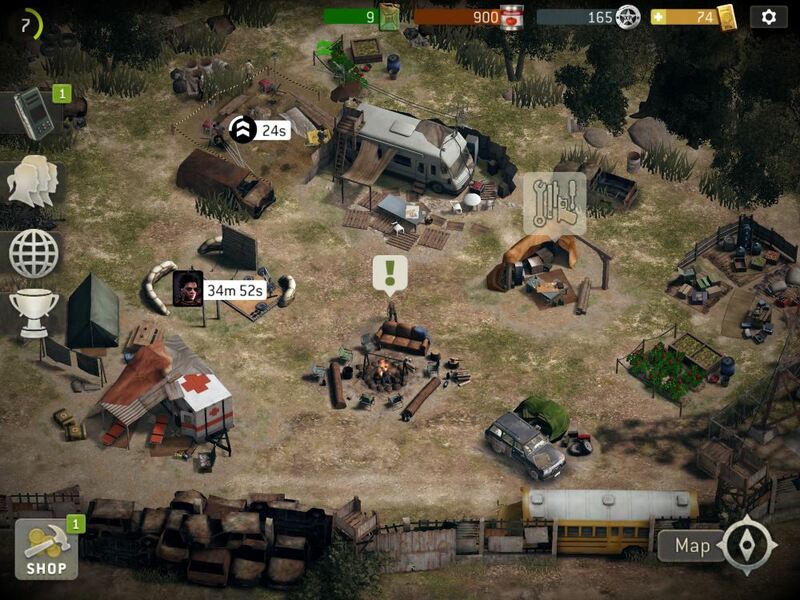 The Walking Dead: No Man’s Land is a mobile, free to play title developed by Next Games for the iOS and Android. It is set in the popular Walking Dead setting, famous from comics, TV, and other video games. It is a “Progress Game” in that the primary goal is to level up your base and characters so you can face ever more rigorous challenges in combat. In this case, the combat challenges are turn based squad tactics style encounters between your plucky survivors and either hordes of zombies and/or other rival survivors. Each combat takes place on a fairly small but detailed map. 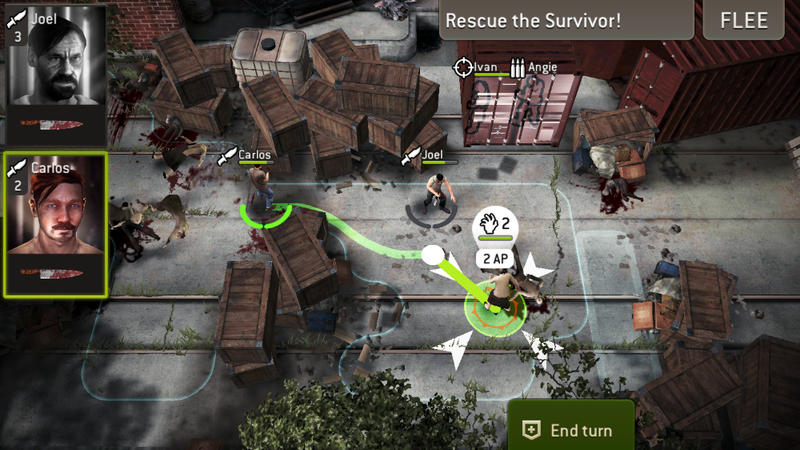 Different scenarios have different objectives, the most common being to scavenge for loot at various locations, and then get your survivors to a designated exit point. The game offers a number of reward structures for completing these missions. There are story based missions that form an overall narrative arc, each of increasing difficulty. There are special event missions coinciding with the ongoing plot and characters from the TV show. There are random looting missions available so you can grind for resources. And finally, they have PvP missions allowing you to compete with other players. Completing missions both unlocks further adventures and generates the bulk of the in-game resources you need for leveling up. The other source of resources come from your camp. Here you erect and upgrade buildings that provide you with resources in real time, and which unlock higher levels for your heroes and equipment. Like many progress games, combat revolves around collectible characters and gear that you can use to equip them. 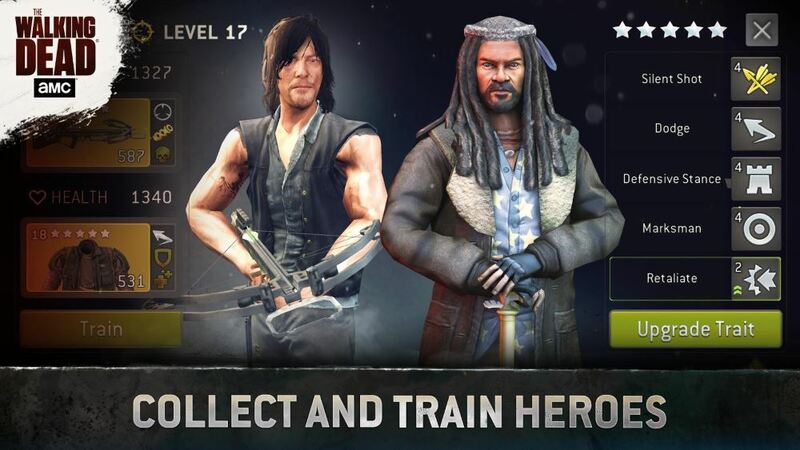 The Walking Dead both features named characters from the show, and randomly generated survivors. The collection focuses on the named characters, some of whom you are given to start with, and others which must be earned as you play. Named characters have leadership abilities that help all the characters on your team, but the random characters are often easier to advance and sometimes can be very strong. Each character has a class based on the type of weapons they prefer to use. There are rifle experts, pistol characters, knife wielders and so on. Each has a normal attack, and a special attack that powers up as they defeat enemies. In addition, each character has a set of abilities that grant passive bonuses as the character levels up. Good combinations of these passive bonuses with active attacks make for stronger characters. Each character can also equip a weapon and a suit of armor. Each of these, like the characters, has a set of passive ability bonuses. Combining abilities from weapons with characters is part of the deeper strategy of game play. Both characters and weapons can be leveled up using in-game currency, rather than through the use of the character. This lets you play stronger characters while developing weaker ones. Other currencies are used to recruit characters. The more of these “radios” you spend the better chance you have of getting rare or advanced characters. Weaker characters can still be developed to decent strength but getting the rare heroes essentially saves you a lot of level up currencies. Like most free to play games, there is an in-game currency you can purchase to more quickly advance through the game, though it can be earned slowly through play as well, so you can play it with no expenditures at a leisurely pace. The Walking Dead: No Man’s Land is a very high-quality game. The graphics are a real step up from other titles of the genre. The sound design is excellent. The use of the Walking Dead property is spot on. The gameplay is very well defined. The user interface is well thought out. They provide regular updates and additions to the game. It has an excellent tutorial. All aspects of this game are a testament to good game design and engineering. I have not experienced a single bug or crash in the time I’ve played it. Is it fun? Yes, it is, at least up to a point. I very much enjoyed it, though I did not find it quite as compelling or addictive as some of my other favorites. I played it consistently for about two months, then tapered off my play as I got into the mid to late game. I had the most fun with the game learning how to play and unlocking new types of heroes and enemies to battle. Once all the basic classes of heroes and enemies are unlocked, however, the gameplay became less compelling and the will to advance diminished. I’m not much of a “grinder” so my play tapered off as more and more was required to advance. The weakness for me lay in the pairing of a fairly technical combat model with a progress oriented FTP system. In progress games, the farther you advance the slower the advancement becomes. This both lengthens the play experience for people and drives the more impatient players to spend currency to advance play more quickly. They also stress the value of leveling. Turn based squad combat is a somewhat intricate affair, which is why I like it so much. Part of its joy is using detailed knowledge of the AI, tactics, and combat abilities to defeat difficult odds with logic and calculated risks. What I found with No Man’s Land is that however good your tactics, you are very hard pressed to defeat enemies of more than a few scant levels of difference. The raw number of HP and damage quickly overwhelms any good tactics. The reverse is also true, if you are too far over level, you need very little tactical skill to win. As the levels advance and the progress slows, this weakness in mixing these two genres asserts itself more forcibly. 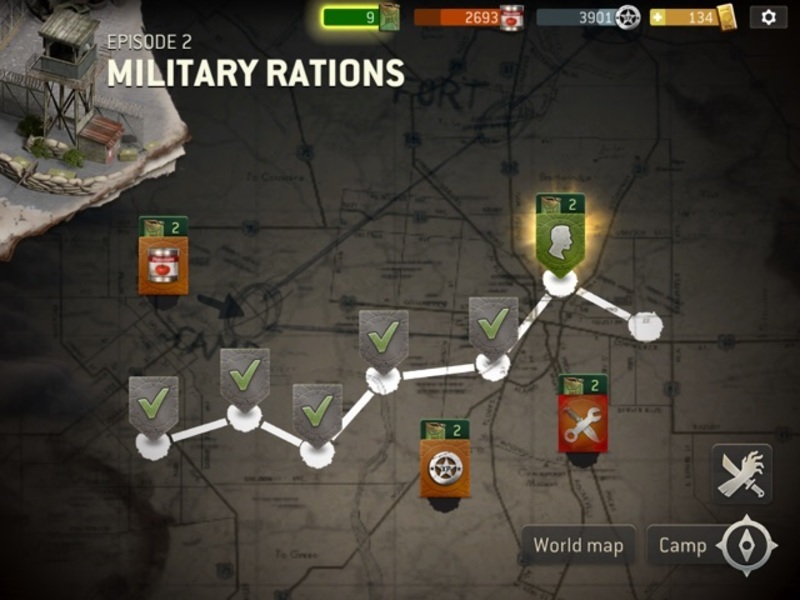 You get to a point where the most profitable thing to do to advance is to play a lot of easy missions, which unfortunately is both dull and time-consuming. It becomes a harder to find missions at just the right difficulty where the play is challenging but not impossible. All in all, I think this is a pretty subtle problem and my tastes in games are part of why it had this effect on me. While I loved the idea of combining these genres, once I hit the mid game, I just wasn’t compelled to play it compared to other mobile favorites. They either had a more skill oriented combat model (Arkham Underworld) or a more involving leveling system with a much simpler combat model (Astronest). I found the game very playable without spending real world money. Most of the time what was on offer for purchase didn’t strongly appeal to me. 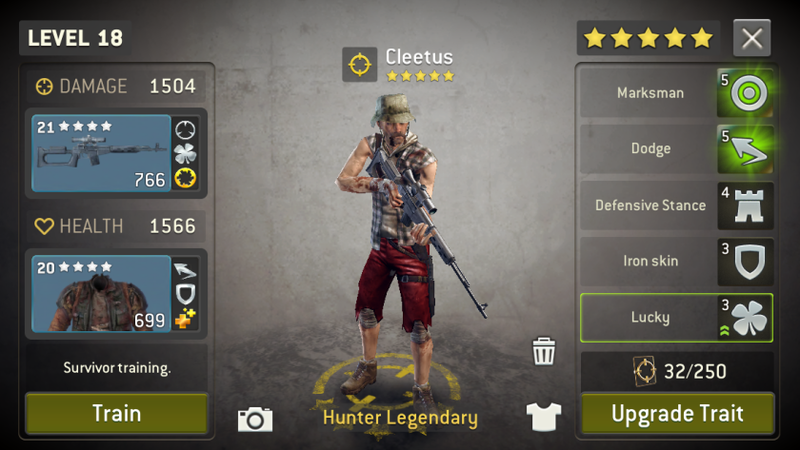 Spending money will help you collect named heroes and progress faster, but it won’t make the gameplay any easier. Whatever level you are, you will face challenges. All in all, I think they did a good job in this respect. The base building aspect of the game is a weak point. There is no real advantage to how you lay it out, yet there is a system for re-arranging it, expanding it, and so clearing space in it. The specific layout or organization is purely cosmetic. The only meaningful consideration in managing your base is which buildings you want to upgrade and when. But even here, the way it is gated means any choices you make are within a narrow range of possibility. Despite my not falling head over heals for The Walking Dead, I absolutely recommend trying it out. I certainly had good fun with it, and it is miles ahead of most of its direct competitors in the genre. It might not have been my perfect cup of tea, but it is a damned fine brew.